Penguin wobbles when the wind blows, and flamingo’s wings and head move in the breeze. Spring: It just makes you want to bounce, sway, do a little dance. 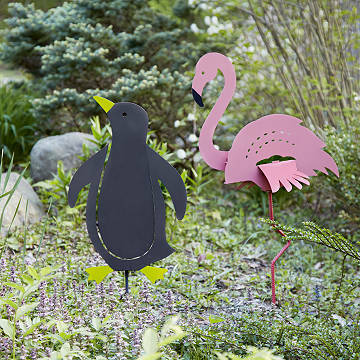 These playfully modern birds certainly think so, and they're built to bring year-round fun to your outdoor space. Penguin wobbles when the wind blows, and flamingo's wings and head move in the breeze. Both are made from powder-coated steel to withstand the elements, so they'll look their best when the weather inspires a garden dance party again. Made in Utah.